Cisplatin 100 mg/mg/m2 IV on days 1, 22, and 43. Combined modality had a significant DFS advantage at 5 years with 45 month vs 32 month median survival advantage. 1. Peters LJ, Goepfert H, Ang KK, Byers RM, Maor MH, Guillamondegui O, Morrison WH, Weber RS, Garden AS, Frankenthaler RA, et al. Evaluation of the dose for postoperative radiation therapy of head and neck cancer: first report of a prospective randomized trial. Int J Radiat Oncol Biol Phys. 1993 Apr 30;26(1):3-11. 2. Langendijk JA, Slotman BJ, van der Waal I, Doornaert P, Berkof J, Leemans CR. 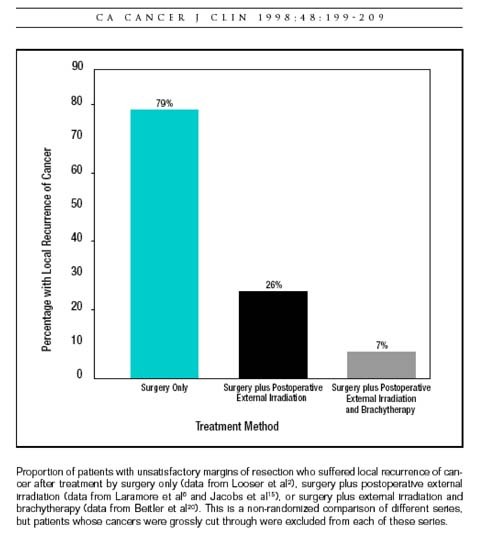 Risk-group definition by recursive partitioning analysis of patients with squamous cell head and neck carcinoma treated with surgery and postoperative radiotherapy. Cancer. 2005 Oct 1;104(7):1408-17.